The 8th round of the Tata Steel Chess Tournament, for 2016, took place on Sunday the 24th of January. It was opened by Joel Veltman, who is the captain of the Ajax football team. It would prove an eventful round for some, and a rather quiet affair for others. David Navara proved a bit of a spoiler to Fabiano Caruana’s aspirations, winning their Nimzo-Indian. Navara went for 25.fxe5 which allowed Caruana’s 25…Bg4, skewering the White rooks. 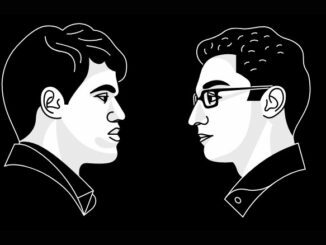 In hindsight, this was probably not the soundest of ideas, but it managed to cause enough complications for Caruana’s human brain to err — and that, at the end of the day, is what chess is all about. After 25…Bg4 there came 26.e6+ Kg6 27.Be4+ and here it seems that 27…Kh6 was preferable over Caruana’s 27…f5 which led to approximate equality. White’s position suddenly became very active, his King worked its way nicely up the board, and Black found himself slightly squeezed and without scope. Navara pressed strongly and manouvered Caruana into a mating net. A very nice game, taking a point from the joint tournament leader. Loek van Wely managed to turn things around nicely in his Sicilian Najdorf against Yifan Hou. To me, White did not seem to be playing with clear intentions, and as is often the case, became a little passive. Black obtained the bishop pair, and lined his Queen up opposite the White King. Surprisingly White seemed to under-estimate this. For example, after 24…Qb6, removing any potential pin mischief along the b-file with a move such as 35.Ka1 would have been prudent, and automatic for many. However, Hou played 25.a3, which just seems rather out of context. Then came 25…a5 26.Qh2 Bg7 27.Rh5 Ba6 28.Qd2 and Black then pounced with 28…Bc3! From here, Black caused absolute havoc, winning material, including White’s rook. White’s position collapsed quickly. A big shame, but I must say that for such a high class Grandmaster as Yifan Hou, I find this a very surprising error. It spurned one of the basic maxims of chess, which is to ‘look after the King’, and quite rightly dropped a point. 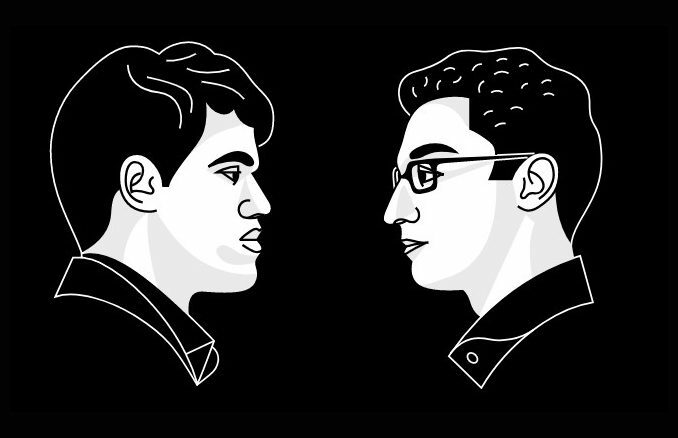 The rest of the games were drawn, Magnus Carlsen holding Sergey Karjakin in a Ruy Lopez. It was a rather tame game, really, nothing very eventful. The same with Ding-Wei, who agreed a very quick draw in their Grunfeld. Wesley So had a nice comfortable game against Shakhryar Mamedyarov, but Black also never really looked in any danger. Even when White sacrificed a knight in order to open Black’s King, it was only to force a draw by repetition. Anyone new to chess, please don’t take your cue on opening a game from Adams-Eljanov. The Open Berlin saw things become open extremely quickly, with Black throwing his pawns forward to leave his King bare. This then wandered up the board, to get right in to the thick of the action on the Queenside. The game lasted 85-moves, which saw Black two pawns up. Had these pawns been connected rather than doubled, it would have been a formality to convert the point. As it was, however, the spoils were split. Black turned things around with perhaps too much ease in the Reti of Giri-Tomashevsky. The Kingside became fixed so play revolved around the Queenside of the board, with White directing pressure against Black’s c-pawn. Unfortunately for Giri, Tomashevsky was able to cover it adequately, and the players called a truce. Magnus Carlsen has the top slot all to himself, then, a half point over Caruana. With So, Giri, and Ding just a point off the lead, there are more than enough players capable of threatening, it is just a question of their intentions. With a rest day on Monday, play will resume on Tuesday and we will see. In the Challengers section, there was triumph again for Anne Haast, who won her second game of the tournament. After spending the opening 6 games at the bottom of the board with 0-points, Anne defeated Liviu-Dieter Nisipeanu in the previous round to get a point on the board. She followed that up in round 8 with a 20-move win over Nino Batsiashvili. Their Ruy Lopez (Cozio Defence Deferred (?) by all accounts) saw White obtaining the best of the opening seemingly effortlessly. Once Haast had successfully opposed and exchanged Black’s fianchetto’d bishop, White held a clear advantage in piece quality. This was such a stranglehold, that Black simply could not develop. Batsiashvili soon found homself in the situation where he had to start sacrificing pieces in order to prevent mate, and resigned. Another very nice game from Anne Haast, who has it seems relaxed and settled and is showing what she is capable of, great to see! Samuel Sevian continues to impress, turning things around nicely against Wenjun Ju in this round. Weilding the King’s Indian, Sevian obtained nice activity for his pieces, and managed to create enough threats to prove a distraction to his opponent and make her make one or two defensive moves too many. This allowed him to seize the initiative, which he did not relinquish. The rest of the games were drawn without much event. This left Adhiban Baskaran in sole lead of the tournament with 6.5-points. Alexey Dreev, who a few rounds ago was joint leader, is now a point off the pace.